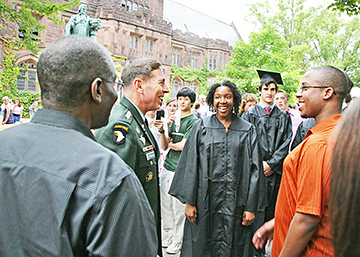 GENERAL STUDIES: Princeton University celebrated graduation over three days, which included remarks from U.S. Army General David Petraeus, A.M. 85, Ph.D. 87 (pictured, with students) during the Baccalaureate ceremony on Sunday; speeches from students in the Class of 2009, and from CBS Evening News anchor and honorary 09 inductee Katie Couric on Monday during Class Day; concluding with Tuesdays 262nd Commencement. Jenny Crumiller and Kevin Wilkes carried the Borough Primary Democratic election on Tuesday, garnering 530 and 470 votes, respectively. The win means they will be placed on the ballot in Novembers election as Democrats for the two contested seats on Borough Council. Challenger Mendy Fisch received 396 votes. The lively three-day-long graduation activities at Princeton University concluded with the 262nd Commencement on Tuesday, which saw degrees conferred upon 1,128 undergraduate and 753 graduate students. Council approved the final agreements between the Borough, the Policemens Benevolent Association (PBA) Local 130, and the Sergeants of the Superior Officers Association in a 3-1 vote last Tuesday. The agreement delineates salary increases, compensation, vacation time, insurance, training, and other terms that are in effect until December 31, 2009, and are retroactive to January 1, 2008. Reflecting on Princetons civil rights history during a panel discussion organized by the Historical Society of Princeton (HSP), four longtime residents who had experienced the struggle firsthand spoke at the Witherspoon Presbyterian Church on Monday about their own experiences while highlighting present-day challenges. After a protracted, contentious discussion, the Princeton Environmental Commission (PEC) voted not to oppose the installation of synthetic turf (syn turf) playing fields in Princeton Parks. The vote was five to one, with PEC Chair Wendy Kaczerski the dissenting vote. Weve had lots of competent people on this board, but weve never been in a situation where we had a finer collection of people, observed President Alan Hegedus at last weeks Board of Education Meeting where new committee and liaison assignments were announced. As the Princeton University womens open first varsity boat prepared last week for the NCAA womens rowing championship regatta, it finally gained a sense of continuity.